610-807 Mobile and Collaborative Learning Development by a Concept of "Mobile-as-Participation-Platform"
610-069 OnLine Assessment in e-Learning: The Elephant in the Room? 610-079 e-Learning and e-Pedagogy: How Do We Know It Works? 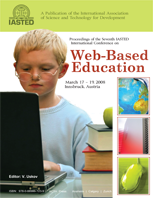 This publication covers the following topics: Web-based Educaiton (WBE); Web-based Training; Online Education and Training; E-learning and E-training; Innovative Teaching and Learning Technologies for Web-based Education; Streaming Multimedia Applications in Web-based Education; Mobile E-learning; Collaborative E-learning; E-Pedagogy; Web-Lecturing Technology; Innovative Web-based Teaching and Learning Technologies; Virtual Reality Applications in Web-based Education; Scientific Web-based Laboratories and Virtual Labs; Software and Hardware Systems for Web-based Education; Authoring Systems for Web-based Education; Multi-agent Technology Applications in Web-based Education; Design and Development of Online Courseware; Reusable Learning Objects for Web-based Education; Educational Portals for Web-based Education; Virtual Universities and Colleges; Online Degree and Certificate Programs; Quality Issues of Web-based Education; Testing and Assessment Issues of Web-based Education; Best Practices of Web-based Education; National Policies and Strategies on Web-based Education; National Projects on Virtual Universities and Web-based Education; International Projects and International Collaboration on Web-based Education; Academia/Industry Collaboration on Web-based Training; Corporate Web-based Training; Web-based Methods and Tools in Traditional, Open, and Distance Education; Blended Education and Training; Faculty Development on Web-based Education; Dot-com Educational Institutions and their Impact on Traditional Universities; and Funding Opportunities for Projects in Web-based Education.